Flies are prevalent in virtually all habitats, with over 16,000 species in North America. True flies can be distinguished from all other insects in that they only have one pair of normal wings. Most flies have compound eyes and mouthparts adapted for piercing, lapping or sucking fluids. Flies are some of the most deadly carriers of disease; millions still die from mosquito-carried malaria every year; countless thousands fall victim to yellow fever, typhoid and dysentery, all caused by fly-born bacteria. On the other hand, flies are important pollinators, scavengers, and parasites of other harmful insects – not to mention spider and fish food. There are over 7,000 species of robber flies worldwide; nearly 1,000 in North America. All robber flies have stout, spiny legs, a dense moustache of bristles on the face (mystax), and 3 simple eyes (ocelli) in a characteristic depression between their two large compound eyes. The mystax helps protect the head and face when the fly encounters struggling prey. The antennae are short, 3-segmented, sometimes with a bristle-like structure called an arista. Robber flies are not known to bite humans and are incapable of stinging. Family Bombyliidae – Bee Flies make up one of the largest families of Diptera, with over 5,000 valid species described worldwide. Their high diversity may be due to the parasitoid habit of the majority of their larvae. Adults feed on nectar and pollen, and are important pollinators of many plants. Bee flies occur on all continents except Antarctica, however their highest diversity occurs in semi-arid and arid environments (Hull, 1973). Bee flies do not bite or sting and are completely harmless to humans and their pets. Bee Flies have pubescent (hairy) bodies and long, slender legs. The proboscis is long, points forward, and is adapted for feeding on flower nectar. Bee fly eggs are laid near the entrance to the nest of the specific bee host parasitized by that species. The tiny larvae enter the nest and usually wait until the bee larva has pupated before metamorphosing from a small, mobile animal to a smooth, fat larva which feeds on the bee pupa. The bee fly pupa is dual-phased. The first pupa is ‘normal’; the second has a sharp battering ram with which to break down the cell wall made by the adult closing the cell. Family Calliphoridae – Blow, Bottle, and Screwworm Flies. Most blow flies lay their eggs almost exclusively in dead or rotting flesh. A few species’ larvae are parasitic on bird nestlings, some have larvae that live as internal parasites of mammals. They are usually the first insects to arrive at a fresh carcass, sometimes within minutes of death; they are attracted by the organic odors of decomposition. Eggs are laid around natural body orifices or open wounds, and the larvae molt and pupate at predictable rates for any given ambient temperature and humidity; it is for these reasons the blowflies are so important in forensic pathology. Maggots (larvae) and pupariums (the hollow cases left behind after the adult fly emerges) collected from a body can be used to determine, sometimes very accurately, the time of death. Family Conopidae – Thick-Headed Flies are often found at flowers feeding on nectar with their long proboscis. This wonderful contraption resembles the spout on the old railroad trackside water towers used during the steam era, or the boom used in mid-air refueling operations. The majority of conopids are black and yellow, or black and white, and often strikingly resemble wasps, bees, or flies of the family Syrphidae, themselves notable bee mimics. The larvae of all conopids are internal parasites, most of aculeate (stinging) Hymenoptera. Adults are said to alight and deposit eggs on their flying hosts. Conopidae live everywhere except the poles and many Pacific islands. About 800 species are described worldwide, approximately 67 of which are found in North America. Crane Flies – Infraorder Tipulomorpha. From Latin tipula “water spider.” The common name refers to the long-legged wading birds. They are most often found in moist woodlands and around water, where their larvae often spend their developmental stage. Adults have a relatively short lifespan of 10-15 days, although the entire brood may last a month or more. The larvae are found in a wide variety of habitats, varying from strictly aquatic to terrestrial. There are ~1500 species of crane fly in North America, and over 15,000 worldwide. Most species pictured here are members of Family Tipulidae, often referred to as “large” crane flies. Dung Flies – Family Scathophagidae is a small group commonly called dung flies, although only a few species’ larvae actually spend their development in dung exclusively. Many others’ larva are plant feeders (leaf miners, stem-borers), aquatic predators and predators on other insect larvae resident in rotting vegetable matter, seaweed or dung. The adults are predators of small insects, especially other flies, as well as eating pollen and taking nectar from flowers. They are prolific predators of blow flies. Worldwide, there are about 360 described species in 66 genera. The family is almost wholly confined to the northern hemisphere; only 5 species are known from the southern. Family Sarcophagidae – Flesh Flies differ from the tachinid flies in that they lack the postscutellum, the large swelling underneath the scutellum on the thorax. Flesh flies have a prominent row of bristles (setae) on each side of the thorax just above the base of the hind leg in addition to another row of bristles just under the base of the wing. These two sets of bristles differentiate the flesh flies from the Muscid flies; they rarely have both sets. Flesh Flies most resemble blow flies, but are never metallic colored. They generally have highly contrasting black and grey stripes on the thorax, as well as a checkerboard-like pattern on the abdomen. Flesh flies also always have 4 rather than 2 or 3 bristles atop the thorax. The hover flies (Family Syrphidae) are a large group of generally beneficial insects. The coloring and movements of most species mimic bees or wasps — they are either stout-bodied and covered with hair, resembling a bumble bee, or boldly patterned with yellow, orange and black, resembling wasps or other stinging insects. Some species even go so far as to wave their front legs in front of their face to mimic the jointed antennae of the potter wasps. Adult hover flies can generally be found hovering in midair or feeding at flower blossoms. They eat only nectar and pollen. However, their larvae can be rapacious predators of aphids, thrips, and mites, or parasitic in the nests of ants or solitary bees. Still other larvae scavenge in soil or decaying plant material or eat living plants. Some are aquatic. Also commonly called sweat bees or flower flies, Syrphids are between 5-20 mm long, very often brightly colored in yellow and black, and have large compound eyes that nearly cover the head. One rule of thumb for identifying hover fly gender is, if the eyes meet at the top of the head, it’s a male specimen. Each wing has a characteristic fold, or “false vein” which can be visible to the naked eye – it is located anterior to the first large vein that runs all the way to the outer margin of the wing. Of course, being true flies, they have only one pair of wings, plus the characteristic halteres, or bulb-like organs that evolved from the second pair of flying wings. In Syrphid flies, however, the halteres are fairly inconspicuous. Family Tabanidae – Horse and Deer Flies. Both male and female adult tabanids feed on flower nectar, and in doing so are important pollinators of many plants. But as with most insects requiring a blood meal for reproduction, females are the ones responsible for provisioning; they do so by biting mammals, some large, including humans, cattle, deer – and of course, horses. Some species prey on birds, reptiles, or amphibians . Male tabanids are rarely seen and do not bite. Adult horse and deer flies are active primarily during warm weather in spring and summer in the north, year-round in Florida and other southern environs. Most species prefer open, grassy habitats near fresh water, where their eggs are deposited on vegetation and the larvae either drop into the water or burrow into mud along the banks . They are variously colloquially called klegs, clags, gadflies and stouts. 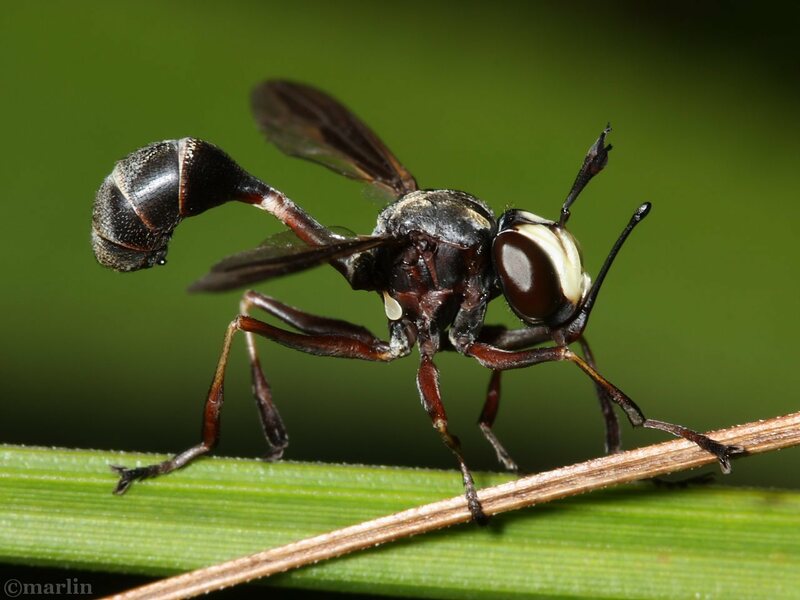 If you’ve ever been bitten by one of these critters, you’ll know to what devastating effect this fly wields its proboscis, parts of which it uses to slice through flesh. I’ve delivered many a vicious slap to deer flies, only to see them fall in the bottom of the boat and then get up and fly away. I’ve been pursued by horse and deer flies when walking in a sunny glade or field — but only if I’m not wearing a hat. It seems they are evolutionarily equipped with “large moving mammal with hair on top” pattern recognition – and have little regard for insect repellent. Family Tachinidae is the second-largest family of Diptera, with over 10,000 species worldwide. Adult tachinid flies are known for their bristly facies. Archytas exhibits prototypical tachinid features, including a large, metallic-colored abdomen covered with bristles. Many other tachinids, however, are sparsely bristled and exhibit very pale coloration. All Tachinids share the parasitoid habit, and almost all of them are endoparasites of other insects; in spite of their varied appearance all species of Tachinidae are alike in this characteristic . Insects most commonly parasitized by the tachinids are the larvae of the Lepidoptera (butterflies and moths) and the adults and larval form of the beetles. Other tachinids attack true bugs of theHemiptera (Heteroptera), larvae of Hymenoptera (bees, wasps, ants, sawflies), and adults of Orthoptera (grasshoppers, katydids, crickets and their kin).